The forest made in T-ara’s name now stands complete in Yeouido’s National Assembly Station and has opened to the public. This forest was funded by T-ara’s Korean fansite, T-araDotCom, along with fansites DIADEM, TARA6JAPAN, T-ARACHINA, and T-ARAHK for the group’s 5th Debut Anniversary. Several countries have contributed to this project, including Korea, Japan, Hong Kong, China, Thailand and Indonesia. The forest houses six trees named after the six members of T-ara; Boram, Qri, Soyeon, Eunjung, Hyomin, and Jiyeon. 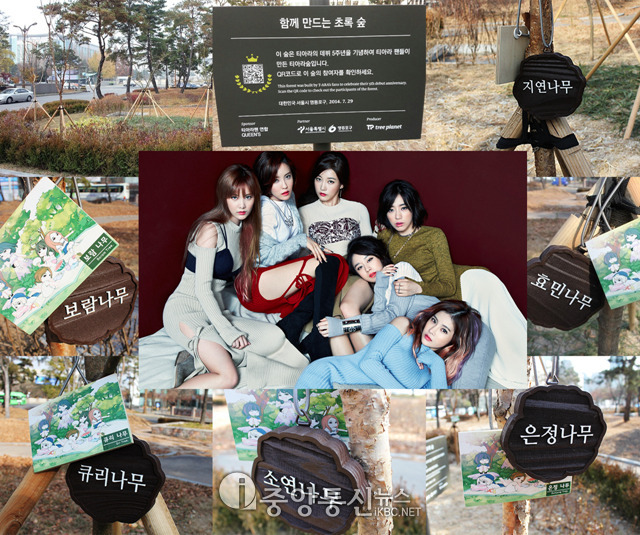 The T-ara Forest project is an eco-friendly place where people can go to relax and is a great way to improve Seoul’s urban environment. Meanwhile, T-ara landed in Vietnam today (the 9th) to prepare for a fan-meeting they are holding on the 12th of January for Vietnamese QUEEN’s. Big thank you’s go out to all the QUEEN’s that took part in making this project possible! Good job Queen’s! You guys are the best. People can see how T-ara’s fans can help the world while cheering them on. wow finally!! i’m so proud of the queens ..
Im in Korea now and i want to go! Where in Yeouido is it? Is it just by the station?